Well, it’s been a busy summer everywhere but on the blog. Again it has been neglected whilst everything has been going on in the background. I thought I share my summer tales through the winter months to cheer us all up through the gloom. There will also be new pattern releases immenently. 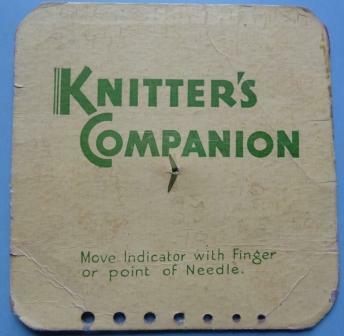 However, I have been thinking about a series of shorter posts to share some of my favourite vintage craft tools. I’ve discovered and been given some real gems over the last few months and so decided that Fridays will be Vintage Friday and I’ll endeavour to share something each week, until the well runs dry, then as and when. This nifty device allows you to keep track of your rows and work through increase and decrease sections marking how many stitches you increase/decrease each row and how many times you work your increase/decrease. 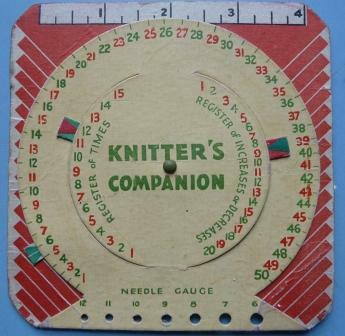 It also has a 4 inch measure across the top – ideal for swatching and checking your tension or gauge, and a needle gauge ranging from old size 12 to size 6. The companion is made of cardboard and I think it has held up remarkably well, especially given it has pencilled notes on the back which are almost worn off, suggesting it has actually been used. I thought it was perhaps a free gift from a magazine, but I’m not sure as I would have expected it to have the magazine name printed on it and it doesn’t. If anyone knows where these may have originated from and when I’d love to know.